Phicen produces 1/6 scale figures as its specialty. Its team is made up of experts in the fields of art, painting, sculpture, and costuming. Its figures have received worldwide recognition, and are adored by amateur and experienced, dedicated collectors alike. Phicen is dedicated to ongoing research in the newest production techniques so they can continue to make the most realistic models with the finest details you could imagine. The company has made itself known as one of the top producers in the collectible figure field through the employment of its near-perfect encapsulation technique. Phicen has a true passion for authenticity and quality, along with a drive to advance ease of production and pioneer manufacturing techniques. These qualities have propelled Phicen into the 1/6 scale world, a world in which it has quickly developed and expanded. As a young girl, Mercy Dante witnessed the murders of both her parents, but was herself spared at the last minute. All she had was her sister Grace, but even she was taken away when Grace killed herself at the age of sixteen. Mercy became bent on revenge, becoming a contract killer just like the murderer of her parents. Eventually, she found her parents’ killer, and kidnapped and murdered his daughter as a way to even the score. The girl’s father, the killer, committed suicide soon after. However, the event haunted her. The daughter’s ghost followed her until one-day Mercy met up with a woman who said she could help her and give her a second chance. Suddenly Mercy was swept back in time to the minute before she shot the killer’s daughter. This time, she let her go. But there was one more thing she had to do. The woman who offered her a second chance asked her to shoot herself in the head, and Mercy obeyed, traveling to hell in the process. What follows is a tale heavily influenced by Dante’s Divine Comedy, specifically Inferno. In his 14th-century epic poem, Dante travels through the nine circles of hell with the Roman poet Virgil as his guide. Like Dante, Mercy finds herself in the first circle of hell, Limbo, with a mission: she is contracted by a mysterious woman to find a man trapped in a certain ring of hell that only Mercy can reach. He is crucial to a war involving humanity, and finding and freeing him is a way for Mercy to redeem herself. She journeys through hell to find him, encountering some surprises, including Satan, along the way. 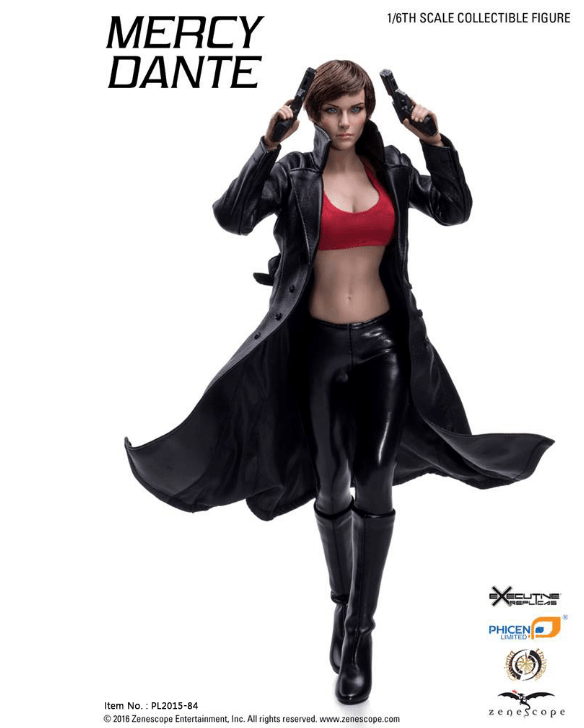 Mercy Dante is clearly one badass woman, and her Phicen sixth-scale figure completely does her justice. Her cracked lips and steel-colored eyes glinting behind the edge of a notched dagger, Mercy is ready for her journey down into the depths of hell. Her seamless body is made with stainless steel armature and comes with cloth costuming, including a long black faux-leather jacket and knee-high boots, a gun holster that sits under the arm, 2.45 automatic pistols, six interchangeable hands, a dagger and sheath, and a base on which to display her. With all of her accouterments, Mercy looks like the unstoppable assassin that she is. Red Sonja has a long history and is one of the greatest swordswomen of comic book lore, earning her the title “She-Devil with a Sword.” She was born in the Hyborian age as Sonja, and lived humbly with her family until a group of mercenaries murdered her father, mother, and two brothers, burning down their house and all their possessions in the process. She cried out in anguish and revenge, and the goddess Scathach answered her call. She offered Sonja unequaled battle skill in return for the promise that she would never sleep with a man unless he had honorably bested her in battle. Sonja accepted the offer and journeyed widely, becoming a legend known for her flaming red hair and striking ability to leave pools of blood from her enemies wherever she went. She was often sought out by men and women who needed her help to defeat whatever evil was afflicting their town or family. Memorable enemies include the Celestial One, Kulan Gath, and Strabonus. Sonja also became a queen when she liberated the Kingdom of Sogaria from the oppressive Emoran empire. However, the Emoran empire remained a threat. She instigated a war between two opposing factions of the empire, while also causing a slave revolt, weakening the empire and throwing it into chaos. Sonja personally dueled Emora’s emperor and killed him, becoming the empress, and gaining a whole new batch of struggles and battles. Red Sonja’s athleticism and mastery of weapons, as well as unarmed combat, and impressive stamina and strength, are all qualities clearly found in her sixth-scale figure. She is made of one of Phicen’s singular seamless bodies supported by stainless steel armature. She comes with over 15 accessories, including three pairs of interchangeable gloved hands, a pair of earrings, faux fur hooded coat and boots, various pieces of armor, and weapons, including a dagger, shield, and battle axe. Phicen has produced a slew of other sixth-scale female figures to enjoy. One of them is the Power of the Valkyrie, a human nurse named Susan who was bestowed with the powers of the Valkyrie. She protected Asgard as well as her Earth from the evil Norse god Loki. Her figure is stunning in an elegant white hooded cape with glimmering silver blue armor. Another notable female is the Shi in Komono (U.S. version). This is the figure of Ana Ishikawa, a highly trained renegade who avenged the deaths of her father and brother by adopting the guise of Shi, death incarnate in Japan. Her figure features Ana in a beautiful floral-themed kimono with her signature weapon, the naginata. It is a wonderful representation of Billy Tucci’s vision for the character. There are even more amazing Phicen females to find online, so go check them out!